This practical raincover will keep your little ones protected and comfortable while you're on the move. 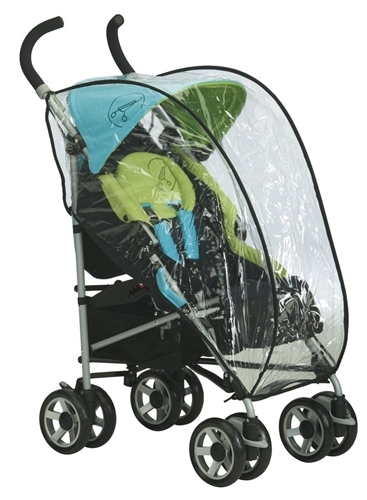 This universal raincover is specially designed for strollers which already have a fabric hood to support it. The design of this raincover has no frame which in turn allows it to be easily folded, compactly away. Easily folds flat away by twisting the raincover like you would a sunblind. Its designs has 2 ribs on either side to help keep the raincover away from your baby's face. I bought this raincover for my Britax B-Lite as it didn't come with a raincover and I couldn't get the raincover for it. However this is much better as it covers more of the pushchair than the bespoke raincover which only covers from the rim of the hood down. The only drawback is it can't be kept on the pushchair's hood due to the shape however it folds up quite small and can hold in the shopping basket. Very fast despatch and arrived in perfect condition.